Listen to your backyard birds sing your praises when your place this Heartwood Orange and Teal Tweetsie Bird House in your garden. The arched sides and curled accents on this home bring a delightful look to your yard, enhanced by its bright color scheme. A pitched, shingled roof combines bold angles with the curves, and copper flashing on the ridge adds a bit of elegance. Lithe, blue trim rests beneath the roof line, contrasting the muted orange tone of the body. A 1.5" diameter entry sits in the center of the front panel, enabling a bevy of songbird species to use the shelter, and ventilation gaps help regulate the interior temperature. Drainage on the base of the unit aids in keeping the nest dry, while a hanging hook on its back allows it to be placed against a wall or post with ease. 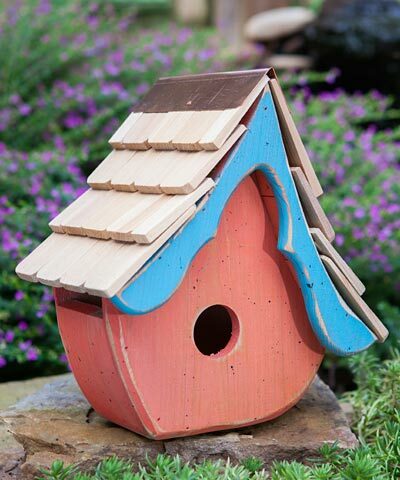 The cypress body naturally resists both insects and rot, for a durable home, and its convenient size allows bluebirds or wrens to use the piece. The orange body lends a bright look to any setting, and the blue trim easily captures attention. Offer shelter to your favorite avian characters with this Orange and Teal Tweetsie Bird House. Made in the USA.